As Inbox by Gmail is still in the early stages of its adoption, it can only be used with @gmail.com and Google Apps Accounts. However it is possible to send and receive emails from your other accounts using Inbox by Gmail. 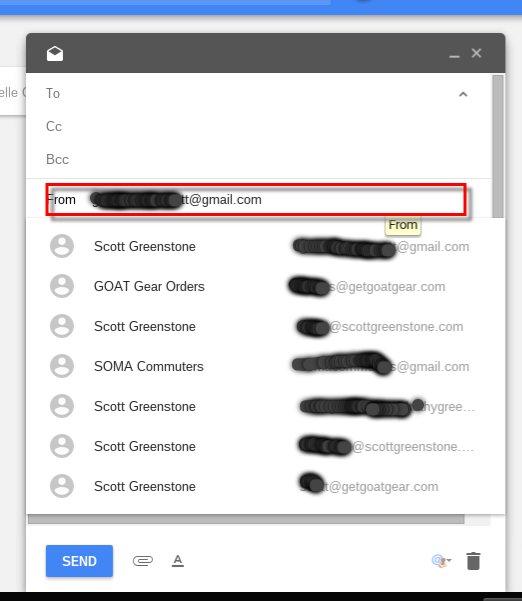 You just need to setup the accounts in classic Gmail as Send as Accounts and POP/IMAP accounts. The steps are simple, and have been detailed in my post here. You only need to change the Google specific settings for your specific account and domain. Once you have these added in classic Gmail, you can now receive your messages in Inbox from these accounts, and more importantly you can send mail from these accounts. Once you are in a compose window, click on the email address in the From field to expand the list and show your options. As you see I have 7 different accounts I can send as from my one Inbox by Gmail logon. But I dont see the option anymore to change it in inbox, and if I try to log into the old gmail it automatically redirect me to inbox and I can not see the change anymore, please advise. You can turn off the redirect from Gmail in the Inbox settings under other. Are you click on the from drop down in the compose as shown above? I have a problem with sending emails from.different addresses on the Android Inbox by Gmail app (I'm using the samsung galaxy s7 edge model). In the desktop version I can choose from which email should the message be sent but i don't see the option to choose inside the mobile app. I don't see the sender address field in the inbox mobile app for iPhone. Try uninstalling the app and reinstalling. Does this work with Exchange accounts? Is there a way to add different signatures in inbox for each of the accounts? Great! Thank you for the resource! why i cant add an account email with imap option to gmail desktop ? ?